Welcome to the greatest collection of barbecue recipes ever. For more than 60 years Weber has been the go-to for all things barbecue. Now the very best of the best Weber recipes, as rated and debated by experts and fans, are all available in this soon-to-be-sauce-stained classic. Weber's Greatest Hits will be the summer cookbook to reach for again and again. Barbecuing has a rich history of celebration and community, with soul-satisfying food that can be enjoyed and shared by all. This comprehensive new guide to the art of the barbecue features championship-level steaks, pepper-crusted rib roasts, juicy prawns, spice-rubbed chickens and a magnificent cedar-planked salmon, as well as plenty of salads and even a grilled pineapple cake. 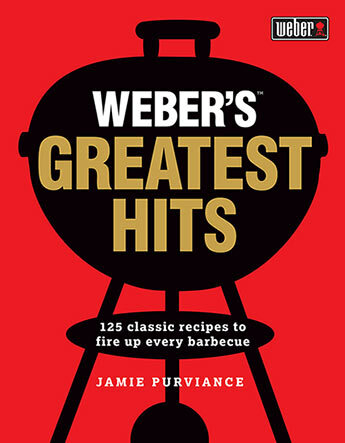 Weber's Greatest Hits will be your backyard barbecue bible for every occasion. Jamie Purviance is a graduate of Stanford University and the Culinary Institute of America. He is an accomplished chef and teacher who has helped millions of people to barbecue like professionals. He is a regular contributor to national newspapers and magazines in America and is the author of many best-selling cookbooks, including Weber's American Barbecue and Weber's Barbecue Bible.